Regular meeting of the Dubuque City Council. 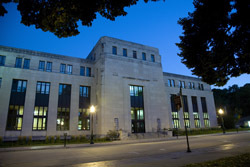 The Dubuque City Council meets on the first and third Monday of each month in the Council Chambers on the second floor of the Historic Federal Building at 350 West 6th Street. Click here to access current and archived City Council meeting agendas and minutes. The meetings begin at 6:00 p.m. and are broadcast live on Dubuque's CityChannel, the local government access channel on the Mediacom cable system on channels 97.2 and 8. Meetings are also webstreamed live and archived on this website. Click here to view live and archived meetings. City Council agenda items are due in the City Clerk’s Office in City Hall by noon on the Wednesday preceding the Council meeting. Meeting agendas are available at 9 a.m. on the Friday preceding each meeting. For more information, contact the City Clerk’s Office at 563.589.4120. Click here to watch a video on how City Council meetings are conducted. If you would like to receive an e-mail notification when City Council meeting agendas and minutes are posted to this website, click here to subscribe. How can I view City Council meeting agendas and minutes? How do I have an item placed on a City Council meeting agenda?